A rhumb line is a curve that crosses each meridian at the same angle. This curve is also referred to as a loxodrome (from the Greek loxos, slanted, and drome, path). Although a great circle is a shortest path, it is difficult to navigate because your bearing (or azimuth) continuously changes as you proceed. Following a rhumb line covers more distance than following a geodesic, but it is easier to navigate. All parallels, including the equator, are rhumb lines, since they cross all meridians at 90°. Additionally, all meridians are rhumb lines, in addition to being great circles. A rhumb line always spirals toward one of the poles, unless its azimuth is true east, west, north, or south, in which case the rhumb line closes on itself to form a parallel of latitude (small circle) or a pair of antipodal meridians. The following figure depicts a great circle and one possible rhumb line connecting two distant locations. 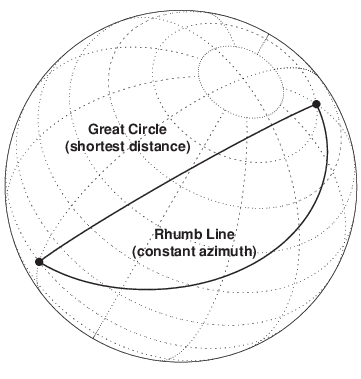 For information about how to calculate points along great circles and rhumb lines, see Generate Vector Data for Points Along Great Circle or Rhumb Line Tracks.